Intellectual property (IP) is a category of property that includes intangible creations of the human intellect, and primarily encompasses copyrights, patents, and trademarks. It also includes other types of rights, such as trade secrets, publicity rights, moral rights, and rights against unfair competition. Ingressive partnered with Rising Tide Africa and long-time business partner Aluko & Oyebode to present the IP Rights “Mini-Masterclass.” Aluko & Oyebode not only won the Chambers Global Africa 2018 Law Firm of the Year Award, but they are also a leading voice in IP Rights for the nation. It was important that Ingressive attracted a leading voice to address the basics and highlight how they apply to businesses at different stages. Nta Ekpiken, a lead associate with the firm, was a perfect fit for the program. Her delivery was calm and direct as the entrepreneurs in attendance sat spellbound. 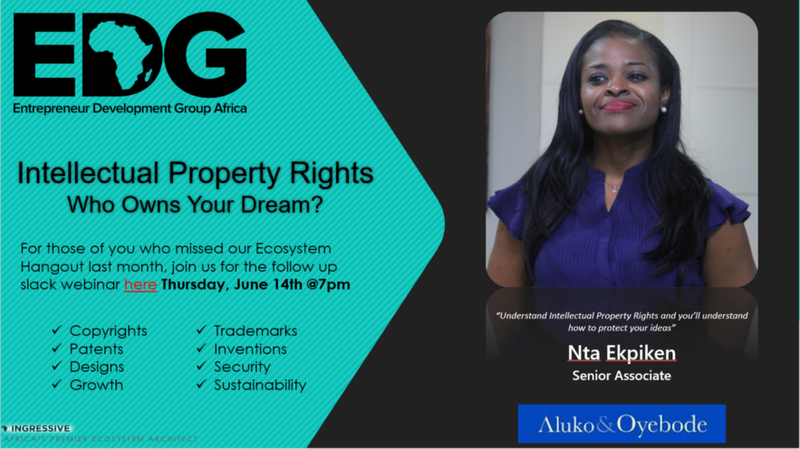 She discussed the basics of IP Rights, business applications, and also led a webinar on the EDG Africa Slack channel for those who couldn’t attend the in-person meet up. The content focused on defining and explaining topics like trademarks, patents, and copyright laws and also included case studies to bring real world examples to help the attendees connect to the content. The Q&A session that followed allowed attendees to go home with specific ways to improve their own businesses. With the lack of trust that exists between entrepreneurs and government, those starting a business rarely addresses the policies and procedures that the law demands. The most driven minds of Nigeria continuously compete to create the innovative ventures of their dreams only to wake up to the nightmare that is ignorance indefensible by the law. The IP Rights online seminar emphasized the importance of knowing the law when EDG Africa group member Edison Irabor told his story about being forced to give up his source code for an app he built for his employer. He was able to receive free legal advice as Ms. Ekpiken explained software is protected by copyright laws and no employer can own any code written for them without written consent. It this interaction that makes feeds the Ingression passion to continue organizing these events. These interactions are imperative to the business future of Nigeria. To band together and uplift the best of Nigerian business potential is the most effective way to compete at a global level. The government can’t be seen a do-nothing entity waiting for your success, so they can take a cut. The law can’t continue to be viewed as an obstacle and treated like a visible trap. IP Rights can’t be ignored at any point of the business life-cycle if a business is to survive. Older PostCan Drones Take The Healthcare Sector In Ghana To The Skies?